Once our initial anger subsided, it was on the phone to Metricon for some answers. We are trying so hard to be proactive and positive but it just feels like one set back after another with this project. We know things will happen eventually and that we will love our house but it just feels so far off and constantly out of our reach. We know Metricon are doing what they can to progress things I think there’s just a breakdown in communication at times. We know our CSC Megan is doing what she can to keep us posted but can only tell us what she has been told. So what’s the story? Due to the changes in our outdoor room dimensions, all the materials have had to be reordered and some re-engineering done to accommodate the change. This couldn’t be done until Metricon received the approved plans from council which only arrived at the start of this week. I guess for us, the most frustrating part is that we have had so many issues and delays so far which are out of our control, to then get back on track, only to have a further detour kinda does our head in a bit. Ok so rant over. When we spoke with Metricon today we got some clarity on what is going on and hope to have the earthworks people on site next week to start sifting the soil on the block. This is due to all the rubble that our less than satisfactory demolition company left on site. So site start will now be at some stage during the week of ending October 12. We got out our sample folder tonight to review all our colour selections for a bit of therapy and to refresh us on what our beautiful home is going to look like. So here’s hoping we don’t have too much longer to wait before we can really start reporting on progress. Site re(restart) is tomorrow!!! Only one more sleep!! On Monday we confirmed with Metricon that they had received the stamped approved plans from the council and that only the engineering plan permits were left to come through, however, this shouldn’t hold up the start. We are really looking forward to seeing some action. Bring it on! We got a phone call today from our Metricon CSC, Megan, to give us some great news, wait for it………we have a site RE(START) DATE – Thursday 27.09.2012!! That’s right, we will have a start by the end of next week!! Great job from the folks at Metricon to get a response and a date on a site start quickly. Let’s hope it goes according to plan and no major issues from here onwards and we get some solid progress before Christmas. Now when everyone asks “how’s things going with the house?” we can now provide a progress update rather than just saying “we’re still waiting for Metricon and the council to sort out the pipe”. Today we also received a copy of the title with the easement back on the title as per the original creation. 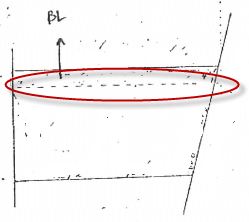 A dashed line (cirecled in red) went missing in action at some stage between 1959 and 2011. So when we did all our house designs and initial permit approvals, an easement was not considered. It will be 133 days (4.5 months) delay when site re(starts) next week. In the end, the cause of all of this is a dotted line missing from the title!!!!!!! We have council approval – Finally!!!! Today marks a very big step forward in our building project. After months of waiting, phone calls, emails and frustration, we finally received notification from council that we have approval to commence building works on site. Yay!!!! The issue of the pipe on our block has been resolved. The easement that was not listed on our title actually does exist, it just went missing in action a some stage between 1959 and 2011. An amendment has been made by the land titles office to reinstate the easement on title. Obviously we would have preferred not to have had an easement on title at all, but at least we didn’t have to get into a situation with the council where we were arguing over whose responsibility it was to have the easement created. As a result of the easement, we have had to move the house 600mm closer to the south boundary which has meant that we have had to reduce the width of the garage. We had originally added an extension to the width of the garage so now we are back to a standard width. Not ideal but in the whole scheme of things bearable. The retaining wall on the north boundary will be constructed 1.4m in from the fence line rather than up against the fence line so we will lose the use of the land in that space, although its nothing that a nice garden won’t resolve. All in all, we can cope with the changes we have had to make in order to get back on site. It has been over 4 months since the pipe issue caused site works to be suspended. Now it is over to Metricon to arrange all of the details for construction to begin again. We are hoping that the construction phase runs smoother than this whole pipe saga. Here’s to calmer waters.